One of the goals of datalogging is to copy the data from the datalogger memory to a computer so that it can be analyzed further. LoggerNet can be setup on an automatic data collection schedule. 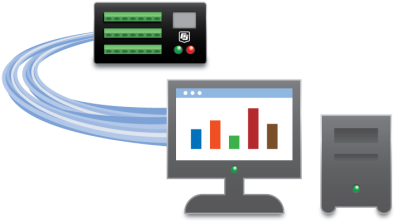 Use the Status Monitor to quickly see the status of data collection throughout your network. LoggerNet, PC400, PC200W and LoggerLink are used to retrieve the data from the datalogger on demand or manually. LoggerNet can also do specialty or custom data collection. External data storage devices can be used for convenient data retrieval from the field. These devices use a variety of technologies, including USB, CompactFlash, and microSD.